Today is a very special day...oh Sorry, i should have used "Auspicious"
ha ha ha ha....just remmemberd what me and my sister used to explain the meaning of "jamaishasthi" during our school days..."Sosur barir gustir shahsthi pujo"
now the phrase..."gusthir shahthi Puja" means...kisi ka bara baja dena( to exhaust someone by torturing them indirectly). Fishes which are available in average...Rs150-200 per kg takes the height rs 300-500 per kg. Hilsha (Elish) becomes available from Rs 1000-1200 per kg whose rate in other normal days varies from Rs 400-500 Per kg. the price of the fruits becomes three to four times higher. why i am talking about fishes? coz an age old tradition for this day is to serve the fish head,should be a big one to the son-in-laws, a small fish head or medium sized can be considerd as lesser love to the son-in-law. Now comes the dress...yes, every son-in-law should receive some expensive dresses from their in-laws house, earlier Dhooti and Punjabi were the traditional one but now a days...shirts, t-shirts and jeans are also welcome. Another traditional thing attached with this ritual is...Umbrella, earlier days with the dresses umbrella used to be an important gift, now-a-days it can be replaced with rain coats. But if you think about foods the fish head is enough then you are wrong...there should be more and more items in lunch,breakfast and dinner. 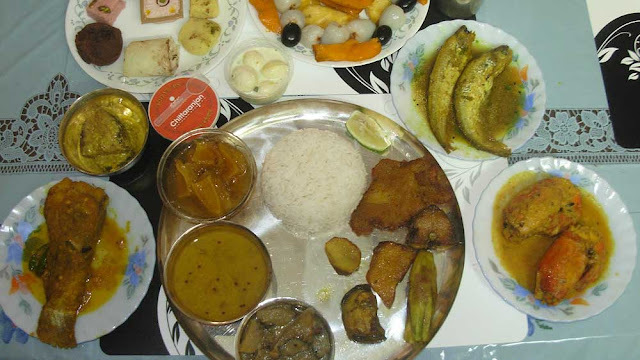 Loochi and Aloor dom(Potato curry) and Begun Bhaja (sliced and fried brinjal), minimum two types of sweets in breakfast. 6.minimum three-four types(actually "five" according to the tradition) of vegetable preparations. 7.chicken(average rate...rs 140-160 per kg but today it becomes rs 180-220 per kg) is not allowed yes...there should be mutton whose average rate is rs 400-500 per kg but this day it takes the height rs 900-1000 per kg. so i hope you can understand that me and my sister were not wrong about this tradition...think about the financial burden the families have to take so that...their daughter get proper respect in the house of in-laws...psychologically this fear always knocks them, specially until the couple completes five years of married life with good understanding. Not a single parent can even imagine to skip this tradition(Out of fear?????) just after the marriage of their daughter...the psychological truth. now coming to the psychological point of view...every father-in-law and mother-in-law will express...they are doing it from the deep core of their heart and yes there is no doubt in this issue but what bout the Jamai(son-in-law), i personally believe...they should be concerned about the financial burden of their in-laws on the other hand the question which has become very common now-a-days is...there is "Jamaishathi" but there is no "Boushahthi or "Koneshashthi" (Bou or kone means married woman". Whether its kaurva chauth or Shivratri or Jamaishasthi the women have to fast. its just a tradition and from the beginning it reflects that our society has always been ruled by the men...the patriarchal society. There is a religious story behind this but how the Jamais(son-in-laws) has got the priority is purely a reflection of our patriarchal society, yes, with that religious story the Jamais(son-in-laws) are not connected at all. so this is the day for the son-in-laws to spend the day with sumptuous foods and the mother-in-laws to spend with fasting and taking care to their jamais. Now another truth is....if a son-in-law informs that he cant visit his in-laws house during this day out of work or have not got leave from office then its OK, but if the son-in-law can visit then his in-laws MUST HAVE TO ARRANGE IT.